Unique I-CHIP design allows information and settings to be transferred between transmitters, increasing flexibility and minimizing spare parts inventory. 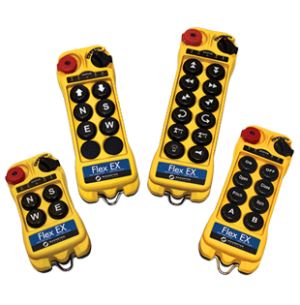 Flex EX radios are available with special operational functions to provide even more control options. A three-position selector switch allows one operator to switch operation between two trolley/hoists (A, B, or Both) that are located on a single bridge. The operator can easily identify which trolley hoist is active on the crane by the position of the selector switch. 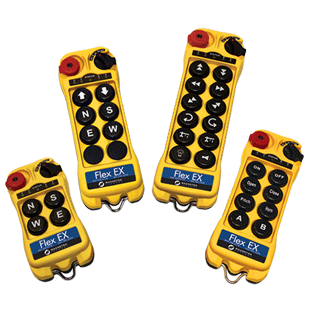 Flex EX radios are available with special operational functions to provide even more control options. Flex EX receivers were designed with field installation and serviceability in mind. Receivers come prewired with 6’ of cable and mounting hardware allowing fast installation. Onboard diagnostic and output LEDs provide system status information useful when installing and troubleshooting. All components are easily accessible and field replaceable. The IP66 rated fully sealed receiver enclosures provide you with confidence and protection in the harshest indoor or outdoor environments.